JSTOR is an on-line digital library for scholars, researchers and students. JSTOR is an independent US not-for-profit organization that converts printed scholarly journals into electronic form and stores them in a centralized digital archive. JSTOR is available to the public through subscribing institutions and there is usually a fee for downloading articles. The Society of Army Historical Research archives back numbers of the Journal in JSTOR. The archive extends from Volume 1 (1921) to the present but excluding the immediately previous two years of publication. This two year exclusion is called the "moving wall" and advances each complete year. SAHR Members have privileged free access to download content from the SAHR Journals archived in JSTOR, providing they access JSTOR via the secure SAHR Members' website. SAHR Members must first login to the SAHR Members' only area of the website using their registered email address and password. JSTOR uses this SAHR login process to recognize the user to be a current SAHR Member who is permitted to download JSAHR content without charge. If a Member has not registered a valid email address in the SAHR Members' website database, then this privileged access to JSTOR is not available. By clicking on the link provided on the SAHR login page as shown below, Members are taken directly to the JSAHR archive in JSTOR. 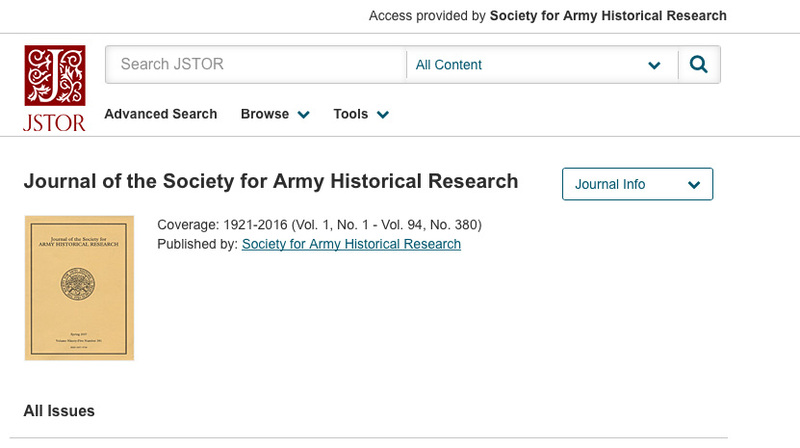 Please click here to access back issues of the Journal of the Society for Army Historical Research (JSAHR) archived in JSTOR. Providing entry to JSTOR has been executed via the SAHR login process, every page of the JSAHR archive will carry the header "Access provided by Society for Army Historical Research" and ensure downloads can be performed without charge. If this header is absent, the privileged access to JSTOR is not recognized and downloads will be charged for. Please click here to access JSTOR's home page.